These dark chocolate million dollar bars are also fantastic with butterscotch chips or peanut butter chips. So if you want, you can add whatever kind you like for extra amazing flavor! Heat oven to 350°F (175°C). Grease 9"x13" (23x33 cm) baking pan or spray with non-stick cooking spray. Mix together melted butter and graham crackers, then gently press to line the bottom of the prepared baking pan. Layer the dark chocolate chips, then chopped nuts. Pour sweetened condensed milk over the whole dish to make sure everything is covered evenly with the sweetened condensed milk. Sprinkle with coconut flakes and crushed pretzels, then sprinkle with optional additional nuts, chocolate chips, and/or flaky sea salt on top. Bake for 15-20 minutes, or until coconut starts to turn a light golden brown. 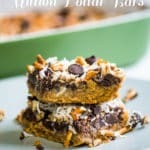 Allow to cool completely, then cut into bars and serve at your favorite parties! It's also great with milk!